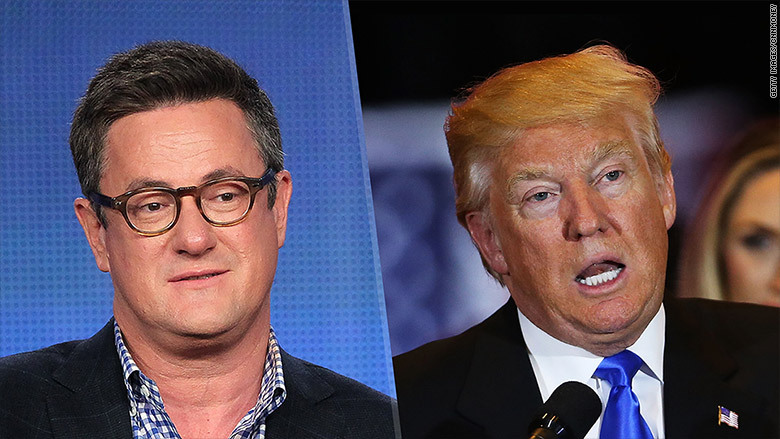 Donald Trump tweeted at Joe Scarborough on Friday saying "Morning Joe" is "rapidly fading." Are Donald Trump and Joe Scarborough really fighting? They're at least acting like it. On Friday the two men had a Twitter spat, which raised eyebrows since Scarborough has been criticized for being overly chummy with the presidential candidate. "Joe Scarborough initially endorsed Jeb Bush and Jeb crashed, then John Kasich and that didn't work," Trump tweeted. "Not much power or insight!" Then he went after Scarborough's MSNBC talk show, "Morning Joe," calling it "rapidly fading." "I hear @JoeNBC of rapidly fading @Morning_Joe is pushing hard for a third party candidate to run," Trump tweeted. "This will guarantee a Crooked Hillary win." Scarborough immediately responded to Trump the way Trump typically responds to critics: by citing his popularity. "'Rapidly fading?' Umm... we are enjoying our best ratings ever," Scarborough shot back. "Lots of luck, fella." The morning host then tweeted, "Define 'rapidly fading,' Donnie boy." It wasn't clear what triggered the back and forth, but Trump might have been reacting to Scarborough's comment on Friday morning's show that "there is not a better time for someone to run as an independent candidate." Asked to comment, MSNBC seconded Scarborough's point about the ratings. "'Morning Joe' just had its best quarter ever and for the month of April 2016, more viewers tuned into 'Morning Joe' than to CNN's 'New Day' in both the key demo and total viewers," an MSNBC spokeswoman said. Both MSNBC and CNN remain behind "Fox & Friends" in the cable news ratings race. But all three morning shows' ratings have been lifted by ongoing election coverage. Between January and March, "New Day" and "Morning Joe" both had their highest-rated quarters ever and "Fox & Friends" had its highest-rated quarter in more than two years. So no show is "rapidly fading," as Trump claimed. The Twitter quarrel perplexed observers on social media. Some even wondered if it was invented by the two men, given the complicated relationship between Trump, Scarborough and his co-host Mika Brzezinski. Scarborough has given Trump political advice; hosted him for numerous interviews; and Trump once called the co-hosts "supporters." The candidate clarified that they're "not necessarily supporters, but at least believers." Indeed, Scarborough has repeatedly touted his early confidence in Trump's chances. But he also said he wouldn't vote for Trump, at one point expressing a preference for Kasich instead. Back in February, Scarborough even said that Trump's failure to disavow support of former Ku Klux Klan leader David Duke disqualified him from being president. The Twitter squabble underscores Trump's testy and unpredictable relationships with media personalities. For months, he singled out Fox host Megyn Kelly for some of his most disparaging tweets. But he recently sat down for an interview with Kelly, which is set to air on May 17. "Donald Trump is currently on good terms with Megyn Kelly & bashing Joe Scarborough/Morning Joe on Twitter," tweeted Al Weaver, a political reporter at the Washington Examiner. "Let that sink in."